Are you planning a festive bake sale this year but stuck for ideas? Well, look no further! We have chosen our top 5 festive recipes from across the web, so you can produce festive treats that even Mary Berry would be envious of! This mouth-watering recipe from BBC Good Food combines two of the nations favourites – brownies and mice pies! 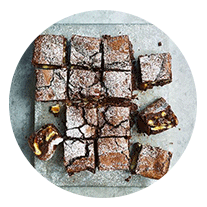 In just 1 hour you can cook up a minimum of 16 brownies to add to your bake sale offering! Fed up of cakes? 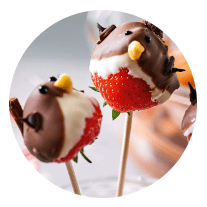 Throw in a fruity option with this Strawberry Robin Lollipop recipe from Waitrose. In just 30 minutes you can have 12 robins to add to your menu! Make your Macarons the best of the bunch this holiday season by adding festive food colouring and decorating them with icing! 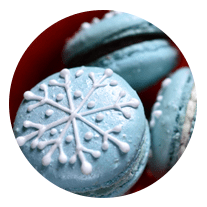 We’ve picked out these Snowflake Macaroons from Duhlicious to kick start your creativity! 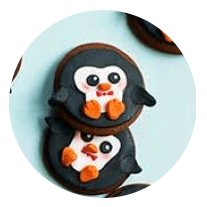 Who can resist a gingerbread penguin? Especially when its for a good cause? These cute little cookies from BBC Good Food will have the masses flooding to your stall! Even better each batch makes 25 penguins! Not keen on baking! 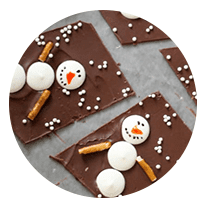 Don’t let that stop you – follow this Snowman Chocolate Bark Recipe from The Decorated Cookie and wow your customers with your designs! you can even customise the recipe to create your own festive snow scenes!